Enjoy unique fishing trips (approximately 3 to 4 hours) in Gaspésie. 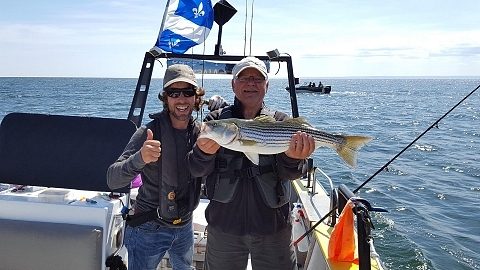 Whether for mackerel fishing, with your family, or simply because a new striped bass fishing experience is appealing, you'll benefit from the advice of an experienced guide aboard a spacious boat suitable for sea fishing. Find out about combined salmon and striped bass packages. Sea fishing and salmon fishing in the river.